The Avengers : Series 6 : Whoever Shot Poor George Oblique Stroke XR40? A guard patrols the building of the Ministry of Technology Cybernetic & Computor [sic] Division. Inside, Baines (Adrian Ropes) worriedly calls Tobin (Frank Windsor) and tells him to get to the computer division quickly - he thinks George is having a fit. Jacobs (John Porter-Davidson) scales a wall, evades the guard and shoots George with both barrels of a shotgun just as Tobin arrives. George - a computer - crashes to the floor as Tobin and Baines rush into the room. Jacobs escapes, knocking out the guard. Tara - dressed for a fancy dress party in a black catsuit, cat mask and green boa - is called to the research centre by Steed. Dr Ardmore (Anthony Nicholls), cybernetic surgeon, has been called in to examine George; he declares he'll have to operate, brushing aside Tobin's objections about moving George. George hadn't been doing any top secret work, just routine equations, and Baines reveals that George first went haywire when fed the latest batch. 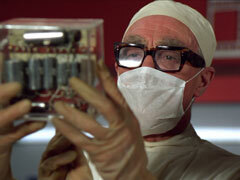 Steed asks to see the equations but Tobin says it's impossible - they're locked inside George's memory banks. Baines suggests reconstructing them from his notes at home and Tara, after ascertaining he doesn't have a dog, escorts him there. Jacobs is already there and steals the equation just as Baines is telling Tara that Sir Wilfrid Pelley wrote it, he just constructed it for the computer. Jacobs kills Baines when they enter, then fights off Tara before escaping. 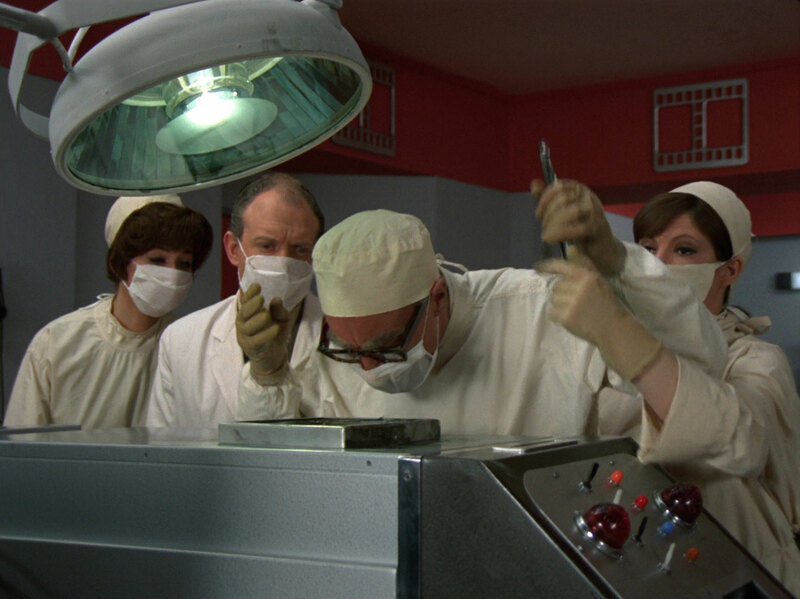 Ardmore meanwhile performs surgery on George, assisted by an anaesthetist (Anthony Nicholls) and two technical nurses (Jacky Allouis & Valerie Leon). George suddenly has an 'electro-spasm' and spits out the message "PELLEY ... TRAITOR". Steed and Tara speculate on Pelley's treachery, Steed going to visit him while Tara guards George. Steed convinces the butler, Jason (Dennis Price), to let him see Pelley (Clifford Evans). Pelley appears to be drunk despite it being early in the morning and refuses to help, saying he had no holiday for three years - and five years at Harwell before that. Steed departs and passes Jacobs sweeping the drive. After he's gone Tobin enters the study, furious with Pelley for feeding the information to George, and orders him to give him the instructions to silence George for good. Back at the centre, Steed obtains Pelley's file from Tobin, who then promises to keep an eye on George while everyone else goes to lunch. Once alone, he pours a bottle of acid into George and fakes an attack on himself. 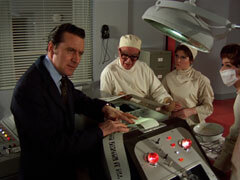 Steed and Tara find Pelley's record is completely unblemished, then the 'attack' is discovered. Tobin is horrified when Ardmore proposes transplanting George's memory banks into an older computer called Fred MK III. Steed returns to Pelley and notices a woman's coat on the hatstand. He tells Pelley that George is on the mend and he's going to Baines' flat to get his duplicate notes which they'll feed into George. As soon as he steps out, an angry woman - Loris (Judy Parfitt) - appears and shouts for Jacobs. She orders him to follow Steed to Baines' and kill him, at which Pelley protests. Steed lays a trap for Jacobs, setting up a statuette wearing his bowler which Jacobs fires both barrels at. 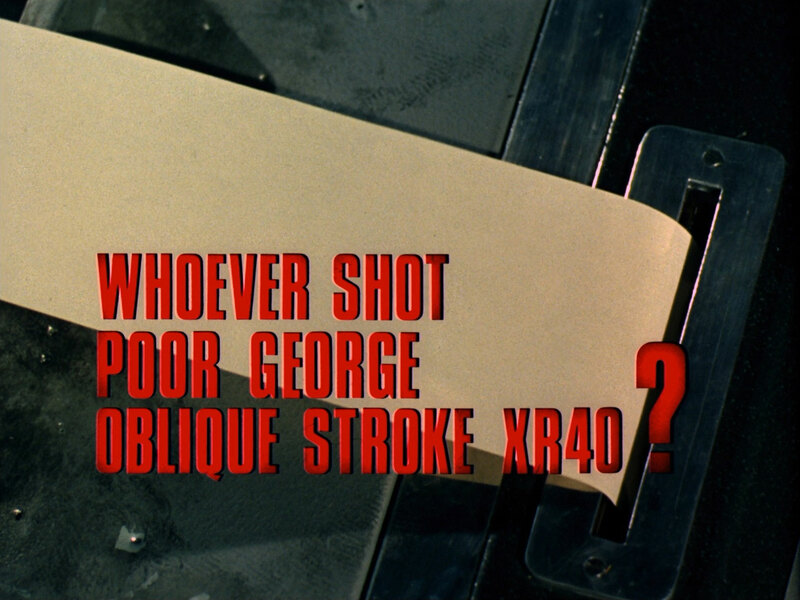 They fight and Jacobs is killed when his pistol shot ricochets off Steed's steel-lined bowler. Steed reports to Tara that Pelley took the bait but they need definite proof - he suggests she infiltrate the house, posing as Pelley's distant American niece, Prunella. Tara is skeptical about any resemblance, at which Steed tells her it's in the knees. 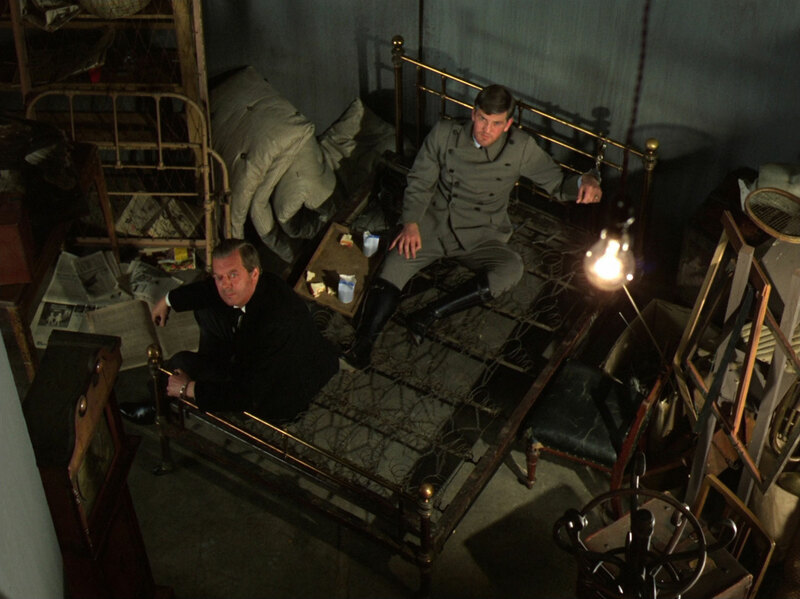 Pelley's chauffeur, Keller (Tony Wright), returns home and reports Jacob's death, causing pandemonium; Loris says they still have Tobin. Tara arrives at Pelley's and presents herself as a dizzy American - she is accepted by Pelley and introduced to Loris, who says she's Pelley's factotum (while hiding a notepad in her purse). Later, Tara searches Loris' handbag, finding a revolver and hypodermic syringe. 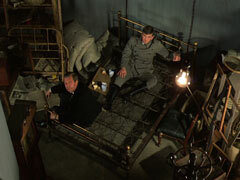 She overhears Pelley being forced to divulge information to Loris and sees Keller deliver food and drink to the cellar. She rings Steed and tells him that she plans to find out who's in the cellar. Tobin tries to sabotage the transplant with a pair of long-nosed pliers but Steed spots him and knocks him out before he can cause too much damage. Repairing George, Ardmore tells Steed Pelley was never at Harwell and Steed realises Pelley had been trying to tell him something. George then bursts back into life and spits out streams of messages. Jason discovers Tara picking the lock of the cellar door. She asks him to keep a lookout while she finds out what's inside and admits to him she's an impostor. When she opens the door and finds the real butler and chauffeur inside, Jason snarls he is an impostor too, and knocks her down with her revolver. George's messages reveal Jason to be the ringleader, Pelley being drugged and interrogated to reveal his secrets. Steed rushes off to save Tara - Jason has ordered Keller to take her to the summerhouse and set fire to it. Steed knocks Keller out then teams up with Tara to capture Loris and Jason - Tara sliding down the bannister to knock them down. 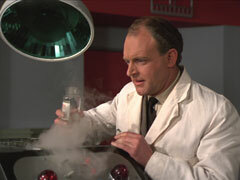 Steed is busy at his flat - George has given him the recipe to the most deliciously potent cocktail possible. At the addition of the final ingredient - an olive - it starts bubbling and they dive for cover just before it explodes. Steed opens a bottle of champagne instead and says the recipe is going straight on the top secret restricted list.